Over 1,000 people were impacted by the work of HearCare Connection in 2015. 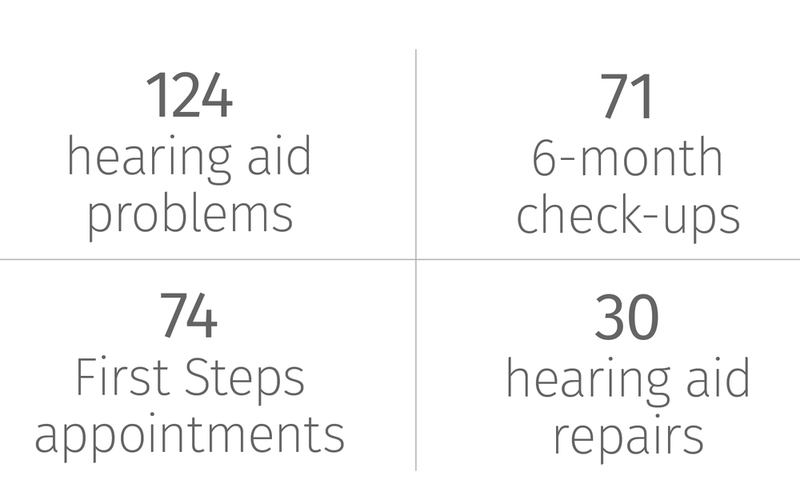 Over 199 hearing aids were fit since we opened our doors in 2012! Our Circle of Giving Program is unique to HearCare Connection. Every patient that receives hearing devices from our clinic puts a set number of volunteer hours back into the community as "sweat equity" towards their aids. These volunteer hours help our patients to reconnect to the world in powerful ways. Our financials from 2014. Thank you to all of the sponsors! Partner, Bonahoom & Bonahoom, LLP. Board meeting dates for 2015 are January 16th, March 20th, May 15th, July 17th, September 18th, November 20th. Executive Board meeting dates for 2014 are February 20th, April 17th, June 19th, August 21st, October 16th, December 18th Board position terms are 2 years and consecutive terms can be served. Minutes are kept at every meeting. 2015 Budget Board Meeting is November 20th. Full Board participation is necessary.